Many of my readers and clients have been asking why soybean is not a good choice for vegetarian source of protein. Soybeans have been a traditional food in many countries both in fermented and fresh forms. Raw and green soybeans are called Edamame and can be boiled or roasted to make a nice appetizer. 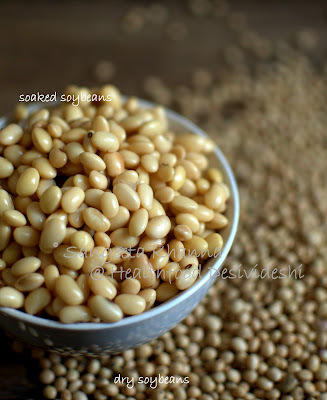 Soy has many health benefits, it is a complete protein with essential amino acids that makes it a valuable protein resource for vegetarians. One of the reasons or controversies around soy is the presence of isoflavones in soybeans that are actually phytoestrogens. Now you would get researches both in favor of phytoestrogens and against it. But it is a fact that in estrogen deficient days (PMS) soybeans would help you deal with symptoms. It would also help during menopausal phase of discomforts. However, taking soy isolates and phytoestrogen isolates can interfere with the way estrogen receptors estrogen responsive genes orchestrate the hormone function, if the dosage is not calibrated correctly. Eating whole soy has not been reported to cause any disturbances in hormone profile. Read here to know more. 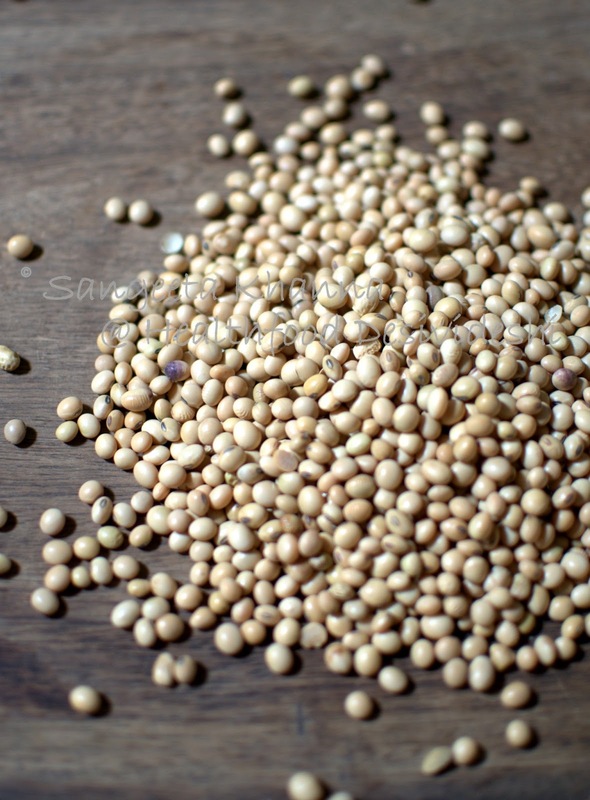 Presence of phytates and oxalates in soy can inhibit absorption of minerals by the system, but phytates and oxalates are present in all the grains and lentils and out body is accustomed to overcome it. If your major protein intake is through soybeans only, you might consider having supplements of Iron, Zinc and Calcium or choose foods that are rich in these. Also, if you are suffering from hypothyroidism, you should take iodine rich foods and keep taking soybean as one of your protein source, especially if you are largely vegetarian. Japanese populations have been taking large amounts of soy products, both fermented and plain cooked soybeans and they also eat a lot of algae that are super rich in Iodine. If there is optimal iodine available to the system, soy products don't affect thyroid function. So if you are concerned whether you should eat soy products if you are a hypothyroid, include seaweeds in your diet once a week or simply a medium sized potato baked or cooked with it's skin. Having natural Himalayan salt or iodine fortified salt is also a good way but we eat too less salt many a times. Read more about Iodine sources. Another compound is Lectins which is blamed for soy not being suitable for consumption, but all vegetarian sources of proteins (legumes) have it and our system does not get so high amount of lectins to cause any harm. Read more about why soybeans are not to be blamed. Talking about soybeans, one more thing that is to be taken care of, is that we should never eat raw soybeans as the presence of trypsin and protease inhibitors in it inhibits the activity of protein digesting enzymes. These compounds get deactivated once the soy beans are cooked. Also, take care to soak the soybeans first for at least 14 hours and then discard the soaking water. Now process the soaked soybeans any which way you like. In the next part of this post, I am suggesting a few ways soybeans can be included in our daily diet, especially in Indian homes. I prefer soaking the soybeans as mentioned above and then make a paste of it using some fresh water. This paste can be refrigerated for further use for a week or so. The paste also ferments well and very quickly in Indian summers. 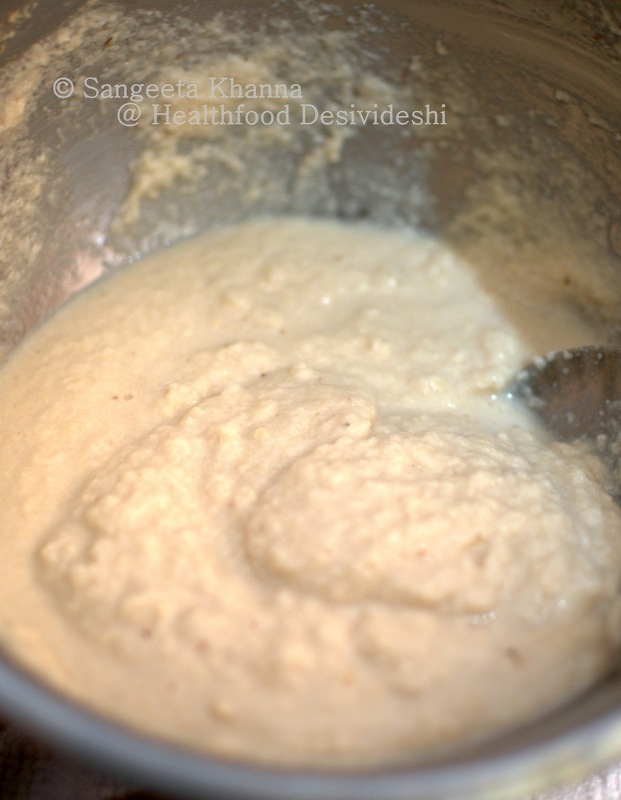 I have experimented very successfully for making idlis, dumplings and chapatis and breads using this soybeans paste in combination with whole wheat flour or rice flour etc. Discarding the soaking water helps remove most of the Lectin phytoheamaglutinin so the protein is more digestible, and does not cause flatulence and bloating. I have written about it regarding kidney beans as well. It is worth mentioning here, that the soy flours available in the market have this lectin and is not suitable for consumption. So it's sensible to start from whole soybeans at home. Tofu and soy milk are safer as these are made after soaking the soybeans. Now let's see how you can use soybeans for your daily foods. 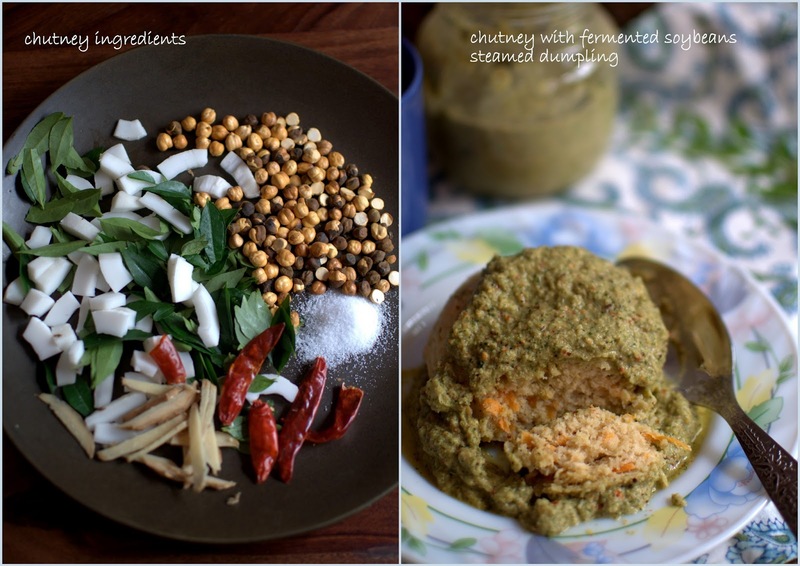 Would you like a dumpling recipe that uses a fermented paste from the fridge, a few more ingredients, a quick whip and steaming for 15 minutes or microwaving for 3 minutes to give you a filling healthy meal? Yes that's how this dumpling recipe works. As mentioned above, one cup of dry whole soybeans are soaked for at least 14 hours, the soaking water is discarded and the soybeans are blended to make a paste using fresh water. This paste looks like idli paste but quite milky in color and texture. Keep this paste at room temperature for about 2 hours so the fermentation process starts, then refrigerate for the whole week. Note that one cup of dry soybeans soak up to become 2.5 cups and then make 3.5 cups of paste. To each cup of this paste add about half a cup of whole heat flour, half a cup of barley flour and 2 tbsp wheat or oats bran. Do not add water and knead a soft pliable dough to make your chapatis. The same dough can be fermented without using any fresh yeast as it makes a nice natural sourdough and can be baked into a free style loaf of bread. 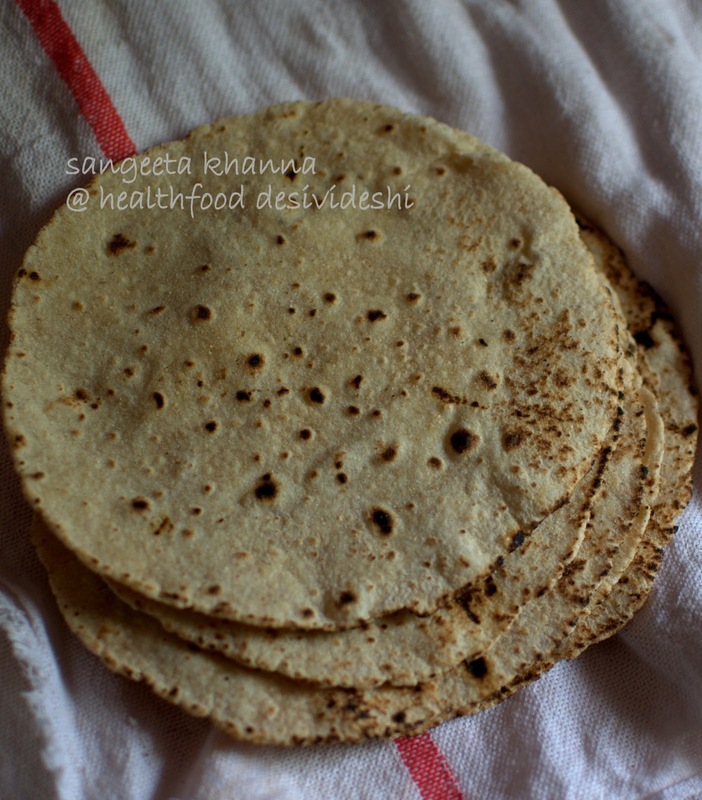 The chapatis are softer than normal whole wheat chapatis and keep well even when you eat them after a couple of hours. These chapatis make a great option for lunch boxes as they are soft even after a few hours. However, you cannot make ultra thin chapatis from this dough. For the dumplings, I add a little coarse barley flour or any millet flour and some grated vegetables, salt and pepper and steam it in separate bowls (I microwave it in greased and covered bowls). You can see the dumplings are served with a chutney made of generous amounts curry patta, roasted bengal gram, coconut bits, dry red chilly and some ginger. Everything blended smooth in the blender with some water and salt to taste. These dumplings taste great with any spicy Indian daal made a little thinner. 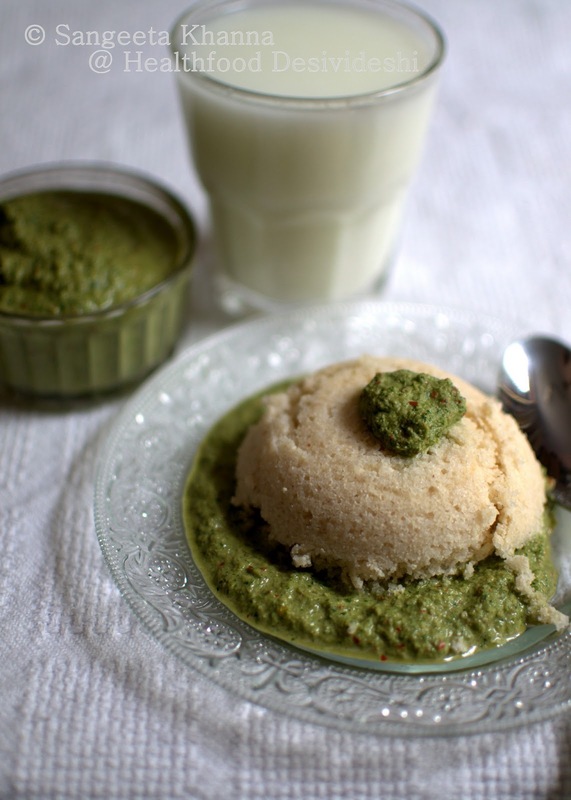 And there is this soybeans idli that tastes great even when you replace urad dal with soybean paste. 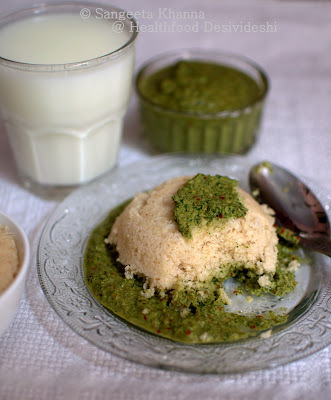 I just add a cup of the said soybeans paste to a cup of idli rawa (coarse rice semolina) and let it ferment. Then steam idli with it. the resultant idlies are softer, spongier but a little crumbly as soy paste is not as binding as black gram (urad dal). The taste is great. 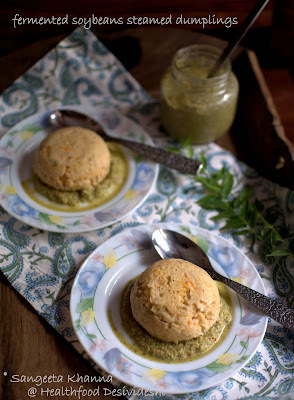 The chutney served with this idli is a very flavorful creamy chutney that used cashewnuts along with a generous amount of curry patta and coconut. See how this idli is steamed in microwave using opal bowls. The boals are greased and covered during cooking time, each idli takes 2.5 minutes to cook and is sufficient for one breakfast serving along with a generous amount of the above chutney. Buttermilk suits well with this breakfast. 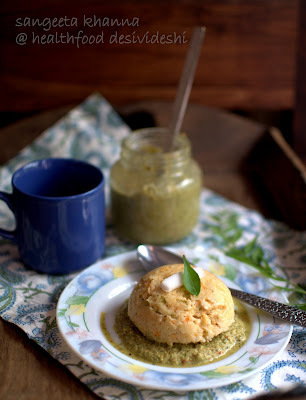 See how fluffy and spongy this soybeans idli is. Do let me know if these recipes help you to incorporate soybeans in an economical way for daily home cooking. The way soybean paste is used, is the best way to process soybeans for frequent consumption. I have posted home made soy milk and tofu and also soy yogurt if you want to experiment more with soybeans at home. I would love to hear from you if this article is useful for you. This post in indeed a great resource for soybean use. I have cried hoarse about the unfavourable effects of consuming raw soya to friends and clients alike. I love the way you have explained everything here. Going to recommend this page to all who love soya so they can use it in safe forms.. Thanks Rajani. Glad you liked it and found useful. Very informative, Sangeeta. Thanks. 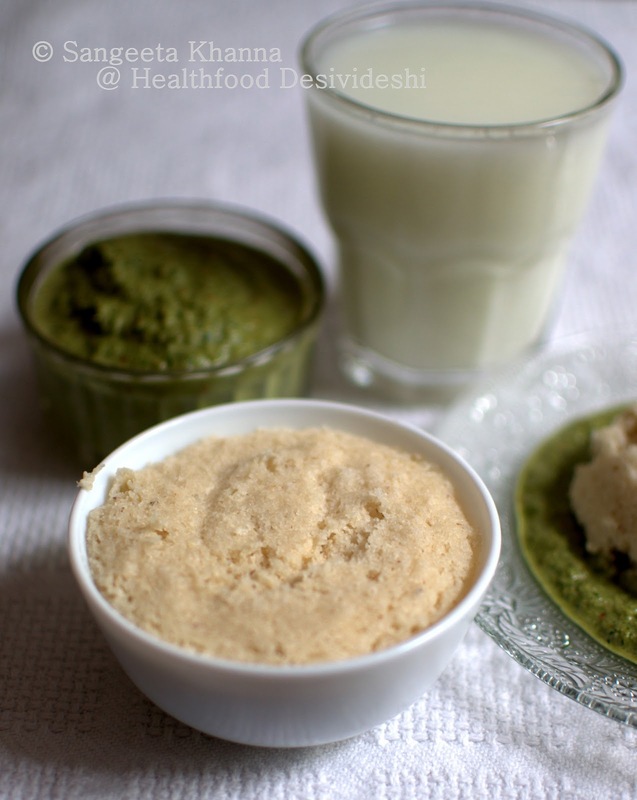 If I intend to add soya paste to wheat flour (for making rotis), is it necessary that I ferment it? You can use the paste fresh or fermented for chapatis. Also the dough can be fermented after kneading if you wish, I say fermented because this soy paste ferments really fast and also because fermentation enhances the food value of grains and lentils. Thank u Sangeeta! Very informative and I must say I hardly new about soyabeans..! !Being hypothyroid, this is indeed very helpful. I usually saw it on the shelves in the grocery shops and went past...! The idlis were yummy..and yes the soy paste ferments really fast..Unlike the urad dal idli wherein I have to plan in advance since there is a waiting period for fermentation.. Try it once Sushmita. I have beaked breads with added soybean paste and the breads were softer than regular whole wheat. The taste can be manipulated well, like the soy yogurt tastes great in raita with a mustard seeds, hing and curry patta tempering. The recipe link is there in the last para of this post. Now to buy soyabean. Have never bought it, but looks like I had better! What a good post! Thank you Deeba. Do let me know how you find it taste wise when you use it. I loved this post and the great ideas. I have a doubt. Is this Soya bean same as what we call 'Rongi or lobia' beans which we make in North. I get lots of variety of Soya beans here so I am a little confused. Awaiting your reply, dying to try out the idli, dumpling and the soya roties. Thanks a ton for such a nice post. What varieties of soybeans you get where you live Shiva? I would like to see pictures if you can send me. Also, the lobia or black eyes beans are different. I guess I will grab the white soya beans and go for it. I loved this post so much Sangeeta :). Its awesome. I am so glad you liked it Shiva. Would be great if the post is useful. I don't like the smell of soya beans. I do like soya bean milk and tofu. Will try making those. Wow!!! Really a great post!!! I really really appreciate your efforts in bringing valuable informations to common people like me.I was a silent reader for a while.Glad to say that your space helped me a lot in my weight loss too. I have some soybeans in my pantry.I was thinking for some days that what all we can do with that instead of making some curry.I always get the recipes what I want from here.Few weeks before I was thinking about the sattu flour uses and u almost posted it the same time.Same applies to Zucchini fritatta and eggless chocolate brownies.Also by reading some of your posts,I can relate atleast some of your thoughts to mine. A small question,u said about soaking and discarding the soaked water of soybeans.Is it applicable to another beans too, including chickpeas? You should be more careful to discard the soaking water in case of rajma and soybeans. Other beans are not that rich in lectins, but discarding the soaking water is safer for sure. Some minerals and trace amounts of Vitamins will be lost but that can be compensated by vegetables easily. Hi. . your post was really helpful in clearing our doubts. . Could you please tell about soya chunks/granules. Are they safe? What the best way to clean/use them. Thanks Sujitha. I will write a detailed post on soya chunks too. Stay tuned.